DOs and DON'Ts of Pet Fashion. Costumed dogs and cats are incredibly cute, but if you decide to dress up your pet, you should first know a few basic guidelines that serve both style and your pet’s well being. 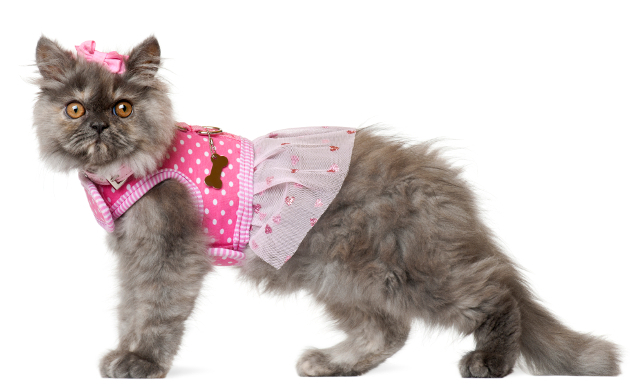 Discover the DOs and DON’Ts of pet fashion and you’ll be more prepared for dressing up your cat or dog. Whether you’re planning on using a costume for Halloween or even putting your pet in an animal fashion show, check out the easy rules of making sure your dog or cat is as happy about the costume as you are. Before becoming fodder for memes, clothing for pets had a very simple purpose: keeping your furry friend shielded from cold weather. Dog and cat jackets and sweaters are especially useful for older pets who suffer from arthritis or other ailments that get worse in low temperatures. Vests and other clothing keep small animals warm whether they’re cute or not. Unless you’re going to a costume party, your pet’s outfit shouldn’t be made from exactly the same fabric as yours. Matching outfits can ramp up the cute factor, but you shouldn’t make your pet wear a truly matching outfit unless it’s a special occasion. If you do want to make your dog or cat and outfit from the same fabrics, make sure they don’t contain any toxic dyes and forget about any special touches like buttons or sequins. They’re very easy to rip off and could cause digestive problems for your pet. The most important rule from the DOs and DON’Ts of pet fashion is making sure that your dog or cat is comfortable in the outfit you chose. Pet clothing shouldn’t be tight and it should be made from fabrics that don’t chafe. Anything that impedes your pet’s ability to walk or see is a bad idea. Even if you’re sure your pet’s outfit is safe with no detachable parts, you still shouldn’t leave your cat or dog unattended. As soon as you leave the room, they might try to get out of their outfit and get into trouble. Worst case scenario, your pet might have trouble breathing, so if you want safe pet fashion always pay attention to dogs and cats in costume. Clothing for cats and dogs should be made from a breathable fabric, but you still risk overheating your pet if the weather is warm. Keep a water bowl close and make sure your dog has access to water even before they start panting. Cats are less likely to overheat, but if you’re keeping them in costume for more than a few minutes, feed them wet food instead of dry. Some cats completely refuse to wear any clothing, but mittens are especially problematic. If you cover your cat’s paws, it might not rest until they’re free again. Making a cat wear very tight clothing or mittens impacts the way they walk and you can instantly see they’re miserable. Don’t let pet fashion turn into animal abuse. Dogs with alopecia and cats little or no hair are at a high risk of sunburn, so you actually need to cover them up if you take them out to play in the sun. You can easily find sun protective clothing for pets and it’s a good idea to buy it, not make it yourself, since it’s usually produced from special fabrics that are both breathable and offer the right protection against UV damage for your pet’s skin. 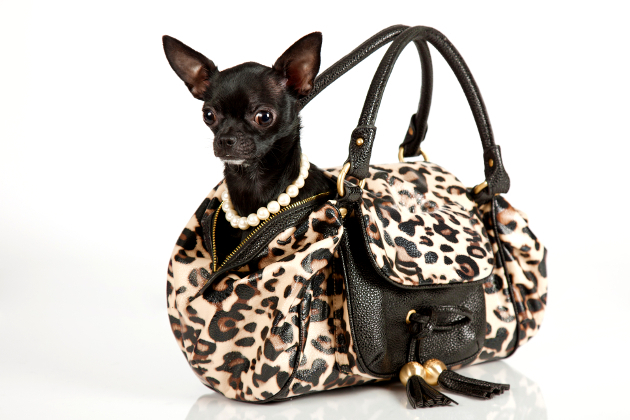 Even if your pet is used to being carried around in designer bags instead of pet carriers, dressing up can be stressful. Unless your dog or cat has gotten used to dressing up, transporting them in a bag the first or second time you put them in clothes might result in too much anxiety and an... accident that might ruin your bag. Even the most patient pets can get anxious when dressed up. If you’re planning a photo shoot, hurry up and get the pictures right after putting the costume on. Don’t expect your dog or cat to have the patience of a model. Pets in hats can be very cute, but heavy headgear is never a good idea for pets. Heavy costumes of any type are a bad idea when it comes to pet fashion. Use your best judgment and don’t weight down your pet with heavy items, not even for short periods of time.